My father joined an ecosystem at Steelmantown Cemetery. When my father died suddenly on an August day I was lucky to have an interest in green burial, acquaintance with Bob Prout (a local funeral director known by the New Jersey funeral industry as their green guru), and experience with Steelmantown Cemetery, a lovely natural burial ground in the southern part of the state. Driving my father two hours to be buried added unfortunate fossil fuel to the equation, but made sense because my mother's family lives just ten minutes away on the ocean side of the Garden State Parkway. 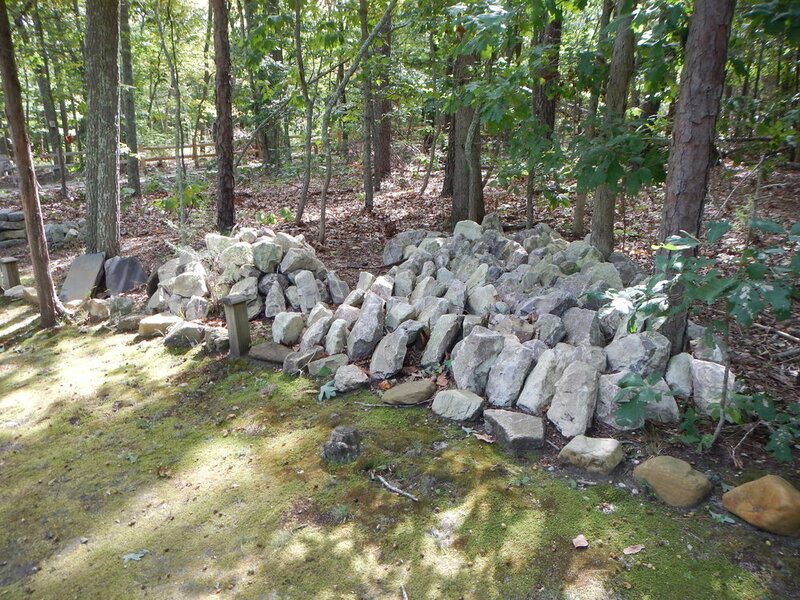 Ed Bixby bought Steelmantown after finding his infant brother's burial place in the overgrown and unwanted historic cemetery. 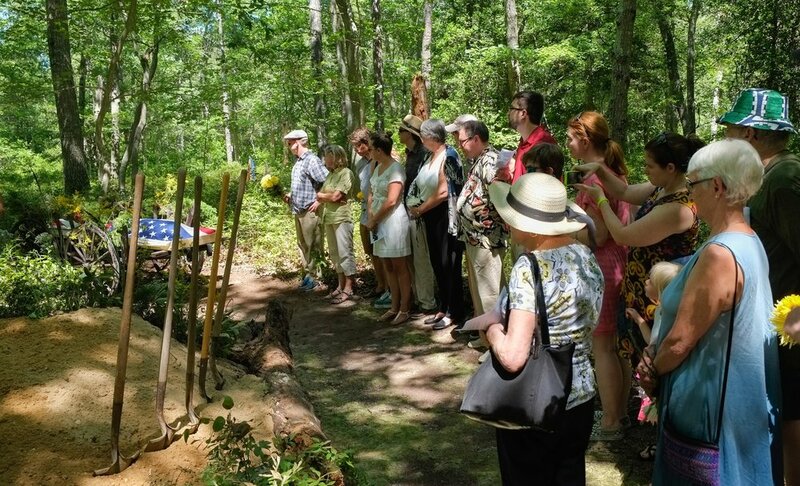 He acquired another 8.5 acres of Pine Barrens and developed it all as a natural burial cemetery, where his Eco Trail winds through oak woods and connects to a section of Belleplain State Forest that had been landlocked. It was 92 degrees and just after midday when our funeral party arrived at Steelmantown. 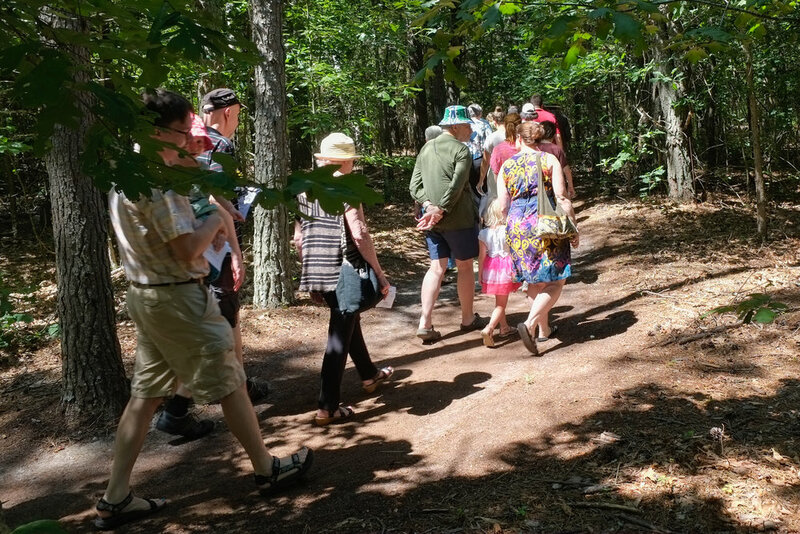 The air sang with heat as we gathered on the path; thirty people including mourners and Ed's gravediggers. Bob, wearing a tie, and Ed, in his boots, gathered us in. Bob suggested that I ask people to take their flowers out of the cellophane they were crinkling, then gave an eloquent synopsis of what would happen next. I was anxious how people would react to a shrouded body so I was grateful for his introduction. 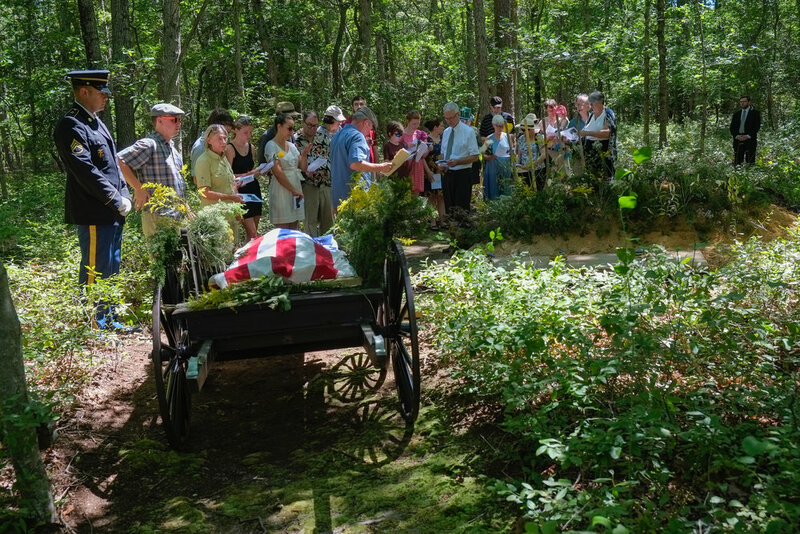 Then as a gravedigger and Ed took hold of the handles on the wagon-wheeled cart on which my father lay, covered in a flag and wildflowers, Bob suggested I help push from the back. So began the slow procession over the winding moss-covered path, lumpy with tree roots. The wagon wheels creaked out a melody and the sweat trickled down my back. We halted by a mound of dirt with shovels sticking out that covered the plot we purchased for my mother. I envisioned a natural burial as being loose and spontaneous, but Bob had prodded us into a structure for which I was grateful. 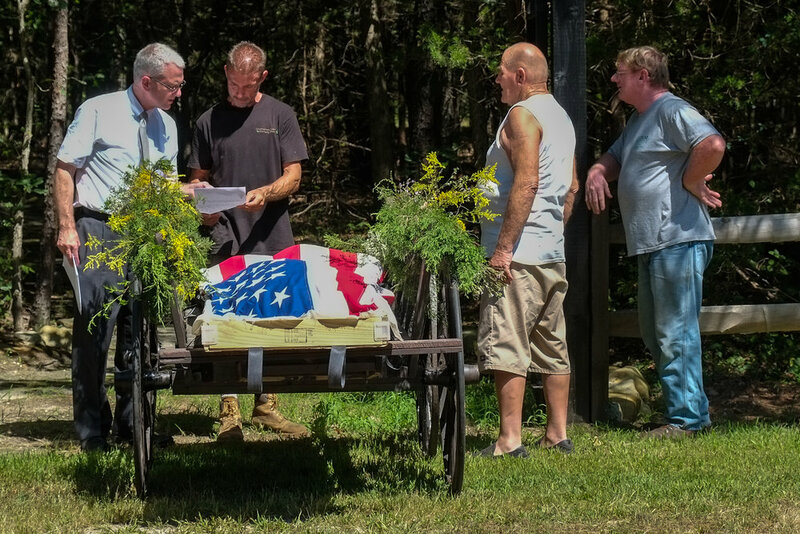 It was capped by the military honor guard folding the flag and playing gorgeous taps while a Monarch butterfly looped restlessly over the open grave. Six people lowered my father's shrouded body in a big muslin cloth into the grave and let the muslin fall over him. We took turns tossing flowers and pine boughs to join those that lined the grave bottom. Ed and his father passed out shovels. My 21-month-old grandnephew in his sun suit was so excited. "Big shovel," he cried out as he helped his mother throw in the sandy soil. I didn't speak myself, and as others read or told stories I let the sun filtering through the woods dry the sweat on my upturned face and I felt the listening weight of all those trees. It seemed much longer going back to the sheds with the empty cart. Ed piles fieldstones dug up from his property and we chose a long flat gray one that would reach across two side-by-side graves. Bob and his assistant were shedding their ties. I invited them all to join us at my cousin’s house for a meal but they wanted to get home before the end of weekend traffic rebuilt. That night I thought about a cousin who was buried just the weekend before in a conventional memorial park in a painted metal casket in a concrete vault under an Astroturf temporary covering — and I realized that my father was not alone. As soon as he went into the ground, he was joined by the beetles, the worms, the bacteria, tree roots. The night crickets and owls. The wild blueberries that had been pulled back to admit his body and would be replanted. It was an extraordinary realization that he had joined an ecosystem. And because he couldn't move it would come to him. It would recycle the nutrients in his flesh and bones and weave them into life. Newer PostUpdating the guide to reflect a growing green burial movement. Older PostA natural burial symposium for towns.